Whether we were ready or not, the Great American Eclipse sped across the United States on Monday like a rocket. Astronomers knew for years that it was coming, and information was widely available as to when and where the moon’s shadow would be, right down to the second. 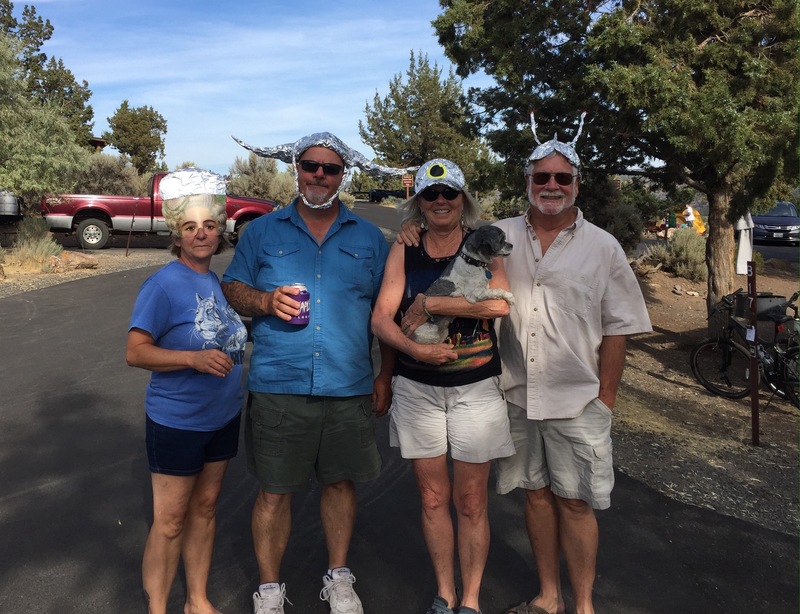 Our location at Prineville Reservoir State Park was 8 miles south of the edge of the path of totality, so we knew we were going to need to get north. The further towards the centerline of the path we were, the longer our experience would be. Diana and I used Xavier Jubier’s interactive Google Maps overlay from eclipse2017.org to scout out numerous locations to view it, which turned out to be an invaluable tool. Predictions of massive crowds had us wondering where we be able to get to, along with the unknown of the smoke from wildfires possibly blocking our view. It would all need to be decided at the last minute. We would have to accept and live with our choice, as the eclipse waited for no one. The first indication of concern for us came last Wednesday morning. We drove north from the state park into Prineville to do laundry and to grab a few last minute items from the grocery store. The parking lots were packed with out-of-state cars and RVs, and US-26 was jammed heading towards the festival east of town. Over 30,000 people were expected at that gathering, and that prediction appeared to be coming true. Later that afternoon, the road had to be closed at the east edge of the city, and traffic was rerouted nearly 100 miles out of the way to get the festival site. With that being said, Google Maps was still showing Madras…ground zero for the best possible weather, according to NASA…to be traffic free. 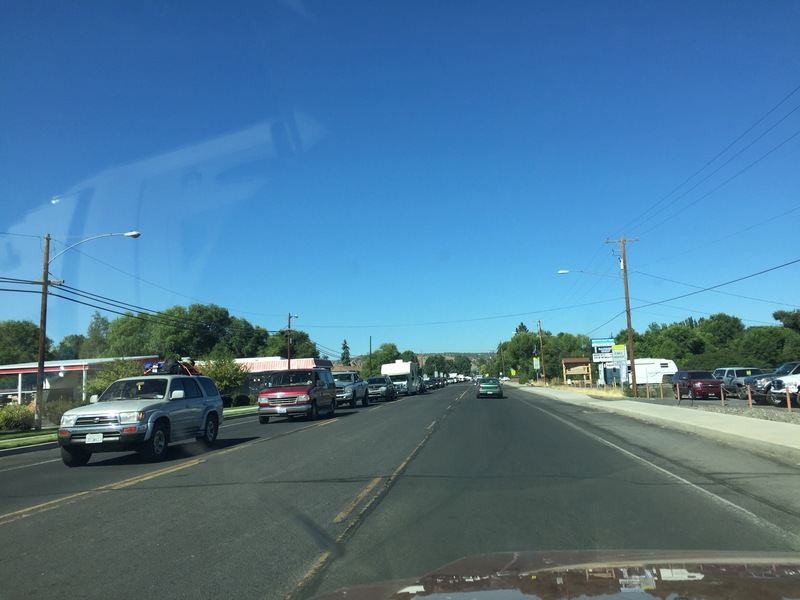 As the weekend approached and the folks at the festival settled in, traffic in Prineville subsided. We decided to stop back into town on Friday, and the supermarket was eerily quiet. Shelves were full and the extra employees were being sent home. No one knew what to expect, and it was interesting to see how everything was playing out. Back at the state park, things became really strange. Tuesday night we went to bed in a nearly empty campground, only to awaken Wednesday morning to it being completely full. By noon, it was empty again, only to refill again that night. Thursday morning, almost our entire loop packed up and headed out at 5 AM to move to locations in the path of totality. Over the rest of the weekend, the fully reserved park slowly began to see guests come in, although it never completely filled. Many people who had made camping reservations months ago stayed home, perhaps fearful of the expected hoards of visitors. The people who did show were here for the eclipse…. …and were dressed to prove it! On Saturday night, we had around 100 guests show up at the stargazing program at the observatory, and we treated them to views of Jupiter, Saturn, Ring Nebula, and the Andromeda Galaxy. Nothing more fun than hearing “Whoooaaah” when a person looks through the eyepiece to actually see something they’ve only heard about in the past. Finally, the big day arrived. Diana set the alarm for 4 AM, and we were on the road at 5. From our campsite, Diana spotted Orion’s Belt, something we had not seen since last winter. The skies looked clear, so we were hopeful. Google Maps was showing clear roads across Oregon, so we headed north. As we crested the ridge between the state park and town, the breaking dawn revealed smoke plumes from wildfires in the Cascades, so we stopped to consider our options. 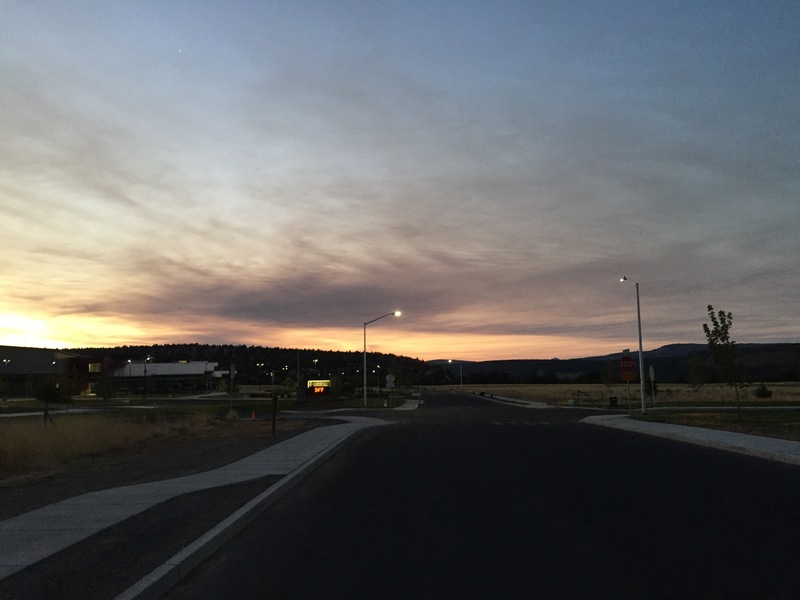 Smoke appeared to be in the direction of both Madras and Mitchell, so we continued into Prineville to re-evaluate the situation. Once in town, we made the decision to go to a new subdivision perched above the city, a spot that would give us an unobstructed view and 70 seconds of totality. 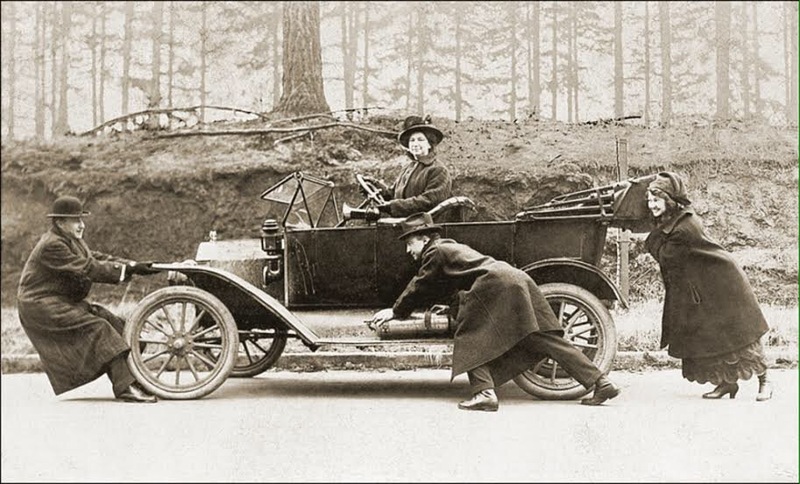 We parked along a curb and watched as Prineville woke up. We were plenty early, but that was just fine. Slowly, cars pulled in and local residents walked from their homes and gathered near the school. The higher the sun rose, the more confident we were that the smoke would not be an issue at our location. While there were several groups of people scattered around the area, it never became crowded. 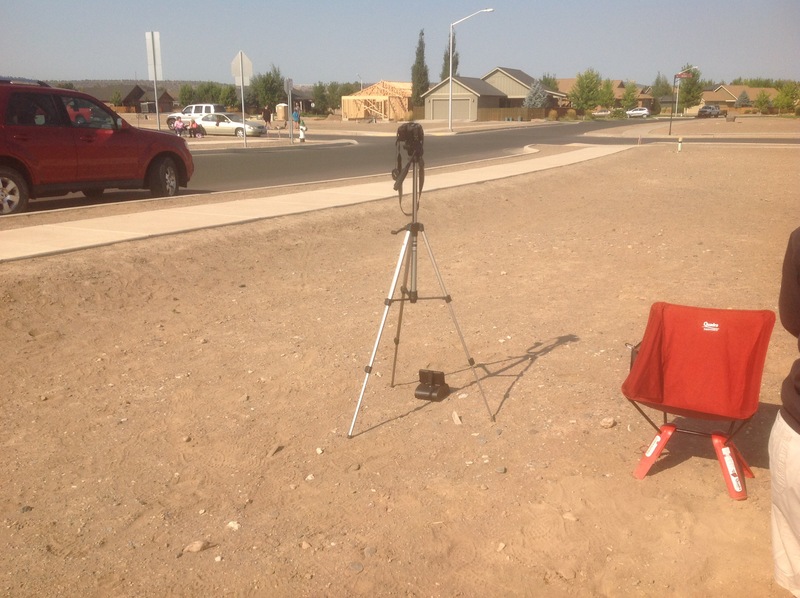 I set our camera on a tripod pointed west, in hopes of catching a video of the incoming shadow. With our eclipse glasses, we noticed First Contact at 9:06 AM. Over the next hour, we watched as the moon slowly nibbled away at more and more of the sun. We set an alarm for 10:17 on my iPad, giving us a three minute warning before the beginning of totality. It was shortly after that point I started the video. A few notes/apologies prior to viewing: I inadvertently had the camera set to autofocus, so the image comes in and out of focus ever so slightly. You will hear me mention “the waves”, a reference to the wavy shadow bands on the sidewalk. I tried to record them with my iPhone…unfortunately, they didn’t show up in the video. Just prior to totality, notice the bird fly away from the incoming shadow, along with the street light coming on. Also, you will hear our reactions, along with the others around us. Despite all of the predictions of what we were going to see, nothing could possibly prepare us for the emotions we felt. After months of planning, for us to be able to witness our moon and our closest star align was, quite simply, mind blowing. So without further adieu, we present our video: Click HERE. It happened fast and was over before we knew it. To hear the others in the distance just added to the joy of the event. 😎 One other thing we noticed afterwards was the birds were chattering like crazy all afternoon. It’s as if they were all talking to each other about what they had just seen. Just amazing! The Great American Eclipse of 2017 is something that will be long remembered. If anyone missed being in the path of totality, don’t fret. We all get another chance in 2024. Do whatever you have to do to get in the path of that one, as it will be worth any amount of effort required to do so. Here’s hoping our lives align with the moon and sun so we can all see it next time! 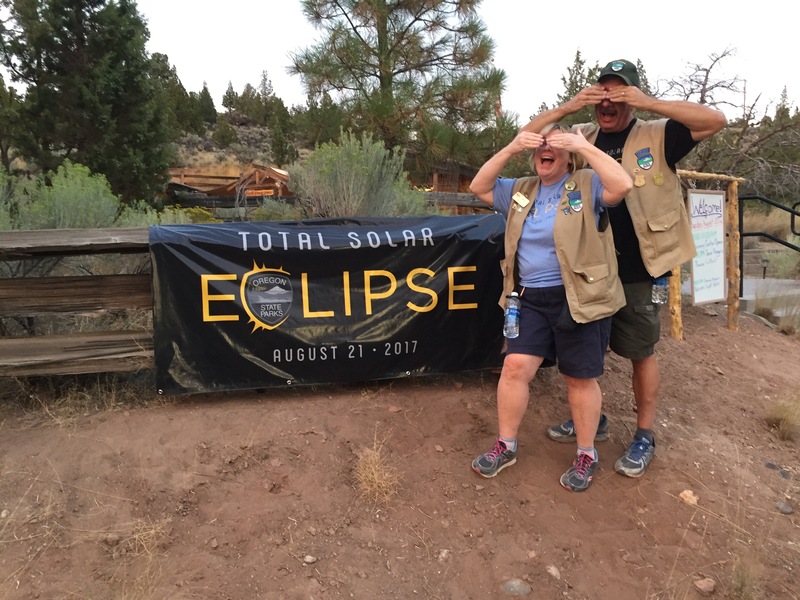 Check out Tracy and Lee’s post showing a video of the shadow bands, along with some great photos! Free Prime video “Totality: The American Eclipse” and other great items available on our exploRVistas’ Amazon link by clicking HERE. Are You ﻿Ready For the Eclipse? Ready or not….here it comes! A lot has been written about the upcoming Great American Eclipse, coming up on August 21. A seventy mile wide swath centered on a line starting at Depoe Bay, Oregon and exiting at McClellanville, South Carolina will see the sun totally blocked by the moon. The entire journey of the shadow across our nation will take a mere 90 minutes. Day will become night in the path of totality, with stars appearing when they normally wouldn’t. 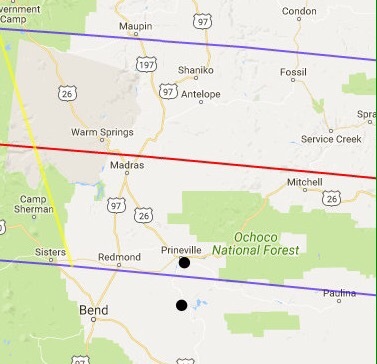 Here at Prineville Reservoir, we are outside of the path of totality, but the city of Prineville to our north is within the path…as shown by the dots on the map below. We plan on positioning ourselves in the path of totality and are still weighing our options. We’ll let you know how it all works out. The purpose of this post is to alert those of you who may not be aware of a few tips about the event, so as to prepare if you plan on trying to see it. Experiencing this from Oregon, we will address it from that perspective. We completely understand that some people may have little interest in dealing with these crowds. Our first awareness of the eclipse was when I read an online piece about it last year. In it, I remember the author mentioning that NASA said the best chance in the nation at a cloudless sky was in the high dessert town of Madras, Oregon, about 20 or so miles up the road from Prineville. The town of 6,000 has a nice airport with a 5000 foot and 2700 foot set of runways, a Safeway and a Thriftway, a KFC, McDonalds, and a Dairy Queen. Toss in four or five gas stations and a bevy of small businesses and that about sums it up. US-97 runs north and south through the town, with a few smaller highways coming in from other directions. 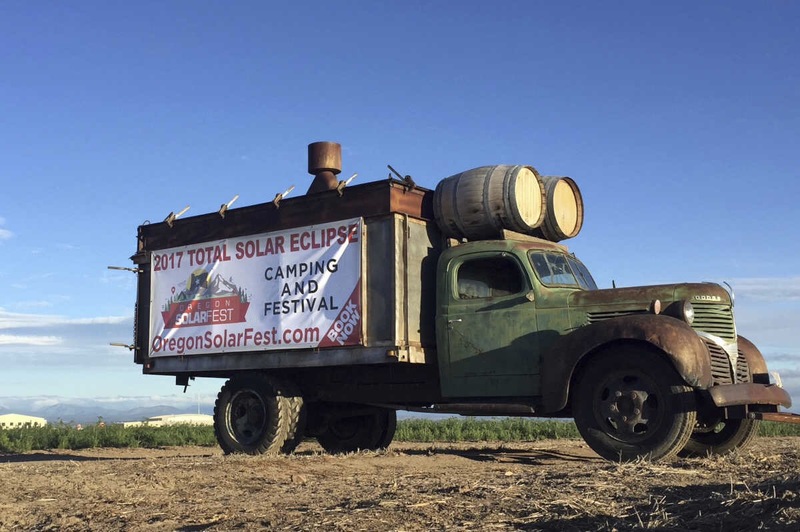 Well, as awareness of the eclipse has grown, Madras began to prepare for the onslaught of visitors…as far back as 2015. Estimates are for 100,000 people to descend on the town, but that number could be conservative. The FAA has capped the airport at 400 planes, and those spots are long spoken for. Many are reported to be famous folks flying up from LA. The normally uncontrolled field is even bringing in a portable control tower. Farmers are mowing their fields and have reserved camping spots for well over $100 a night. 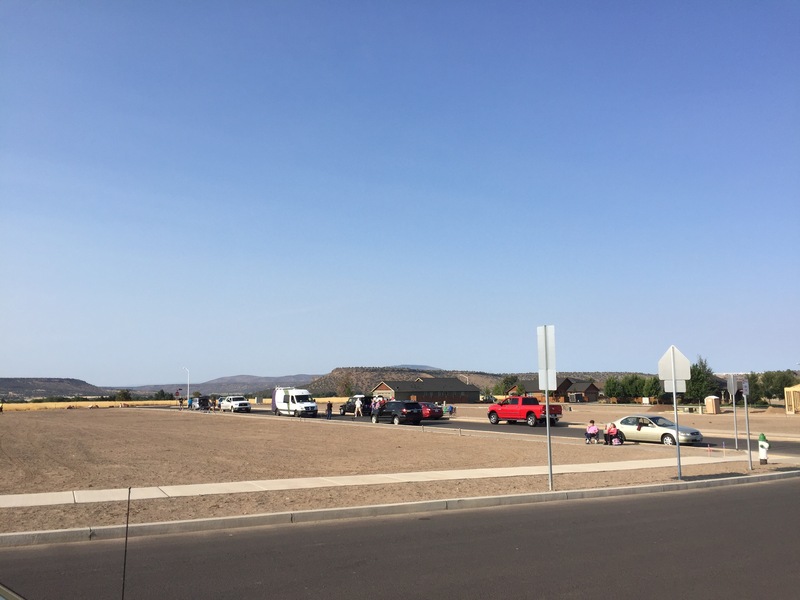 Prineville will be home to a festival that officials are capping at 30,000 people….and that’s just the festival. Many more will be pouring into town from all over the world. It’s going to be fun, crazy, scary, all rolled up in a few amazing days. And once the sun comes back out, everyone is going to want to leave at the same time! If you attempt to show up the day of the eclipse, you stand a good chance of ending up in a traffic jam and missing it. Campsites and lodging sites have been sold out for years. Also, just pulling off the roads here is easier said than done. ODOT has trained workers in push, pull, drag training; meaning if someone is blocking the road, the road crew will move it by any method needed, so emergency vehicles can get through. The roads around central Oregon have steep shoulders and drop offs, so pulling over isn’t a great option. Parking in dry grass could start a wildfire, which is a huge concern in these parts. Not only that, smoke from a wildfire could obscure the eclipse! And watch where you step, as there are rattlesnakes here. Also, remember that services such as restrooms, groceries, gasoline, drinking water, and cell service will be overloaded, as will the power grid. Self contained RV’s hold an advantage in this regard, so be sure to stock up your supplies and top off your fuel and water tanks way ahead of time. Prineville officials are expecting people to start coming in on the 15th, but we’ve talked to one camper who is already here for the event. The state is gearing up as if this will be a natural disaster, and for all intents and purposes, it could be! If the majority of people are patient and respectful of others, the Great American Eclipse promises to be an unforgettable experience. Many of you will want to be as far away from this as possible…and that is perfectly ok and understandable. But if this interests you and there is any way for you to get into the path of totality, by all means, do it. Veteran eclipse watchers say that close is not close enough! 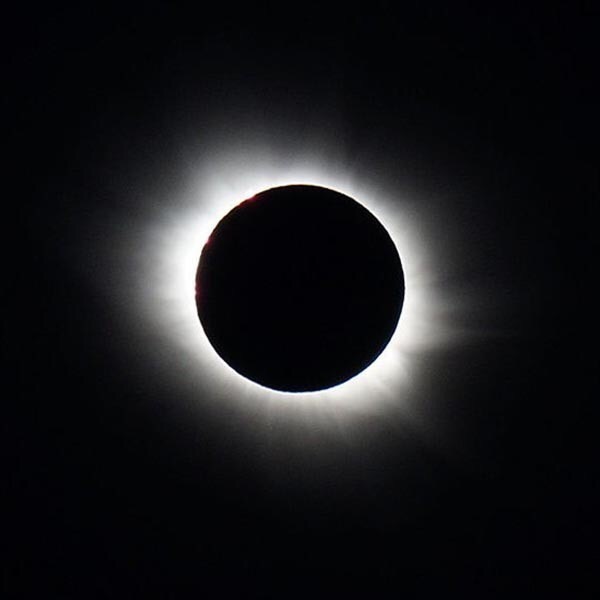 If you are wondering what you could possibly see that would be worth all of the trouble, Eclipse2017.org explains it as being much more than the moon covering the sun. It’s the veil of blackness that hits you at 3000 miles an hour, the 360 degree orange glow on the horizon, the air cooling, the stars and planets appearing, and the adrenaline rush of being a part of it all. Many people who have seen one in the past say it is the most beautiful thing they have ever experienced. Above all, have fun and if you’re up for an adventure, give it your best effort to get yourself into the path of totality! This is going to be an amazing event…one you will remember for the rest of your life. 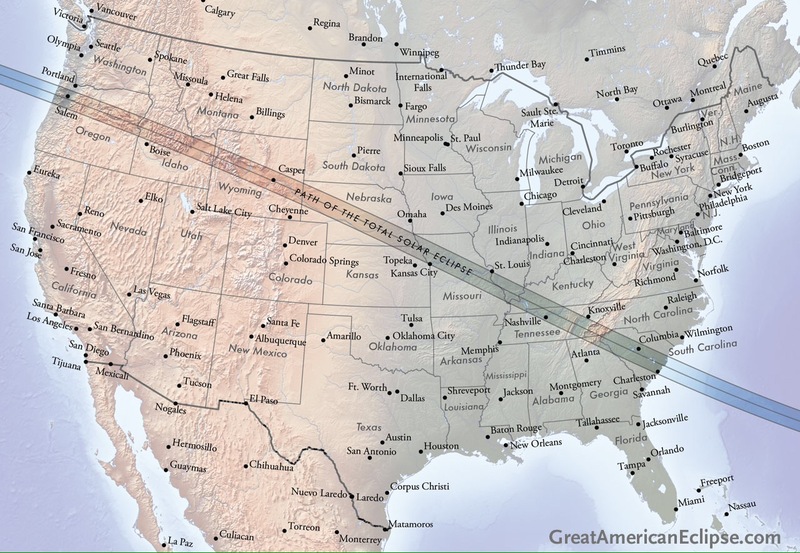 Where will you be during the Great American Eclipse? ISO certified eclipse glasses and so much more on our exploRVistas Amazon link HERE!